Imagine going into a marketing department at a new company and creating a modern marketing Demand Factory™ from scratch. Where do you start? What do you focus on first? How do you get everyone you’re working with on board with your vision? This is exactly the scenario marketing guru Doug Sechrist has faced numerous times—at companies such as Taleo, Eloqua, Five9 and, most recently, Infusionsoft—and he’s an expert at it. In fact, Doug has a blueprint that he has used with repeated success, and a few weeks ago, he took the time to walk our own David Lewis and the DemandGen Radio audience through it. David: Doug, explain what you’ve rolled out in the past year at Infusionsoft. Aligning people to the organization’s goals: You have to have the right team and people aligned with the right functions, goals and practices, to be successful. Thinking long-term: Your blueprint must get you from points A to B. Often, people jump into a new job with a lot of goals and challenges, but don’t look ahead far enough to understand where the company’s going and what it will take to get there. Building a culture of measurement and data improvement: Although hard to do, it’s a critical step. If you’re not looking at the right measurements, you’ll fall flat. David: Telemarketing is usually a big part of the Demand Factory. Should that function fall under Marketing or Sales? Doug: That’s a common question, and the answer is, it depends on the maturity of your marketing model. When I arrived at Infusionsoft, the function reported into Marketing, but I moved it into sales because our marketing processes needed work. After about a year—during which I replaced the demand funnel and worked to establish a culture of performance and measurement—Marketing was driving growth and prospect volumes to healthy levels. So, it was time to move them back into Marketing for the time being, to take advantage of the momentum and build alignment. But ultimately, telemarketing folks want a career path into Sales, and eventually, that’s where they belong. David: Creating a Demand Factory involves leveraging various tools and technologies for setting up processes such as lead management, lead scoring and others. There are thousands of tools to choose from. Does your blueprint incorporate or recommend certain tools? Doug: When I set out to create a new blueprint, my first objective is to understand how things currently work in the organization, from the time a lead is generated, to the closing of a deal, to customer retention efforts. The blueprint isn’t meant to capture every nuance of the process, but rather to provide insight and alignment about where it’s working, where it’s not, and what needs improvement. Once you have alignment, the organization understands which technologies need to be applied or removed. By eliminating tools that are not useful, you can free up budget to put better, more appropriate tools in place. David: Take us through the blueprint of your demand factory. Doug: We start at the top of the funnel, with the concept of how a lead becomes a deal. You’re generating leads from various sources, so you have to define how data records get into the system, how to normalize and append the data, and how to score the leads. Depending on the scenario, the lead takes a different path. Does it go into a nurture? Is it routed through the sales development process? The blueprint enables me to create alignment across all functions on how to handle leads, and provides clarity to everyone involved in the process as to where they fit in. At Infusionsoft, the audience is SMB. There are 30 million SMBs out there, and our addressable market is about 6-7 million. Our average MRR is $271, so we need a massive volume engine. That means generating thousands of leads and opportunities per day. It’s very intense. So our blueprint looks at activities driving leads today, next week, next month, and so on. We’re a content-led demand factory, and we have a large content marketing team pushing out tons of content every week, all aligned to customer pain points and problems we solve. Our goal is to drive subscribers, not leads, through paid and organic search, events and social media to create volume. Also, the conversion engine is a critical component. We’ve got several nurture programs based on personas, verticals, stages in the sales cycle, and so on. The more we can engage and deliver value, the more likely a subscriber is to become a customer. David: What’s top of mind for Infusionsoft in 2017? Doug: It’s all about scale. I’ve done a lot of work building up the marketing stack and getting people and processes aligned with performance KPIs. Next year, we’ll be figuring out where the next $100 million in revenue will come from. We’ll focus on channel innovation and optimization, and while we will continue to scale and improve core channels that got us where we are today, we’ll also be looking for new ones to reach a wider audience. DemandGen’s PodCast Series features interviews with top industry experts, thought leaders, authors, marketing technology firms and senior marketing leaders from around the world about their methods and technologies for high-performance marketing. 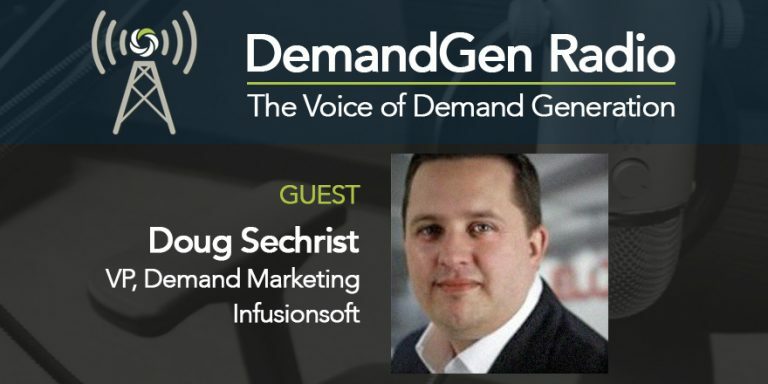 Listen to the full podcast with Doug Sechrist at DemandGen Radio.